In the lair, the Turtles are enjoying a pickle and egg pizza when suddenly the sewer is racked by a series of explosions. 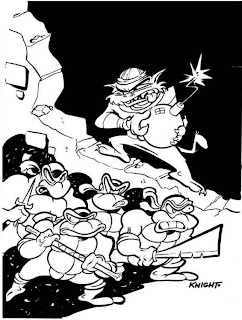 They go through a newly-formed hole in the tunnel wall and find the Uncanny Trio randomly destroying the sewer tunnels with bombs, looking for revenge. The Turtles attack, but Hallocat knocks them senseless with another bomb. The next day, all sewer maintenance workers are discharged from duty until the infrastructure repairs can be completed. One worker, Horton, decides to have his last lunch, a pizza, in the sewers. Suddenly, the Turtles appear, begging him for a slice. Having no memories of who they are, Horton takes pity on them and invites them back to his place. As soon as he arrives, his roommate, Malphie, comes home. The Turtles hide in various places around the apartment as Malphie laments that all bus drivers have been laid off until the streets can be repaired, too; and right before he could buy his wife an anniversary present! Malphie spots the Turtles and has a sudden epiphany; he’ll train them to be wrestlers as a Coney Island attraction and rake in enough dough to buy his wife something special! Housing them in the basement, Malphie and Horton train the Turtles until the big day. 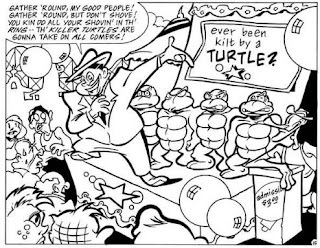 And when the big day comes, April sees an advertisement in the newspaper featuring the “Killer Turtles”. Having not seen the Turtles since the sewer explosions, April grabs a camera crew and heads out to Coney Island for answers. In an alley, the drunken and homeless Uncanny Trio spot the newspaper ad, too, and realize that their job isn’t finished. At Coney Island, Malphie (as a carnival barker) invites all comers to take the Killer Turtles in the ring. April tapes the whole thing, wondering why the Turtles have glassy looks in their eyes. On a rollercoaster up above, Nevermore the Scarecrow hurls an elephant at his unsuspecting foes, intent on crushing them. The elephant knocks the Turtles out (otherwise being none the worse for wear), leaving Horton and Malphie to wonder what the big idea is. They spot the cackling Uncanny Trio and give chase. Nocturno has a plan and leads their pursuers into the Fun House. Once inside the dark spook show, Nevermore breaks out a shotgun and opens fire on Horton and Malphie. The two elude his shots thanks to the hall of mirrors, then tackle the mutant animals and a brawl breaks out. Outside, the blow from the elephant has restored the memories to the Turtles. April helps them come to as a child mentions that the two wrestling promoters are currently engaged in a fight with the Uncanny Trio inside the Fun House. Not wanting to miss the action, the Turtles rush to Horton and Malphie’s aid, pummeling the crap out of the three evil mutants. The next day, the paper reports that the Uncanny Trio has been “vanquished” and all repairs to the sewers and streets have been completed, allowing maintenance and transit employees to return to work. Horton and Malphie may not be going back to their old jobs any time soon, though, as they’re now loaded with dough (which Malphie has used to buy his wife a mink coat for their anniversary). In the basement, the Turtles enjoy their payment for services rendered: Boxes and boxes of cupcake and eggshell pizza. *Chronologically, there aren’t a lot of places this story could go. Between TMNT Adventures #27 and TMNT Adventures #28 looks to be just about it. *The Uncanny Trio previously appeared in TMNT Adventures #27. 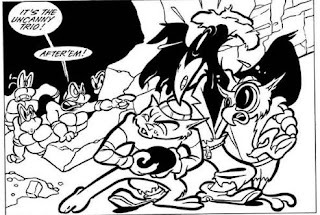 *This story was originally completed by Milton Knight to be published in a 1993 TMNT Adventures Special. The story was put on hold with intent to print at a later date, but the unexpected cancellation of TMNT Adventures kept the story from ever being officially published. Milton Knight made the story available to view on his website on September 5, 2008. You can read it here. *Horton and Malphie are, of course, parodies of Ed Norton and Ralph from “The Honeymooners”. Incidentally, in the Fred Wolf cartoon, Muckman and Joe Eyeball were portrayed as parodies of the same characters. Hey, the Uncanny Trio! Never thought I’d see them again. 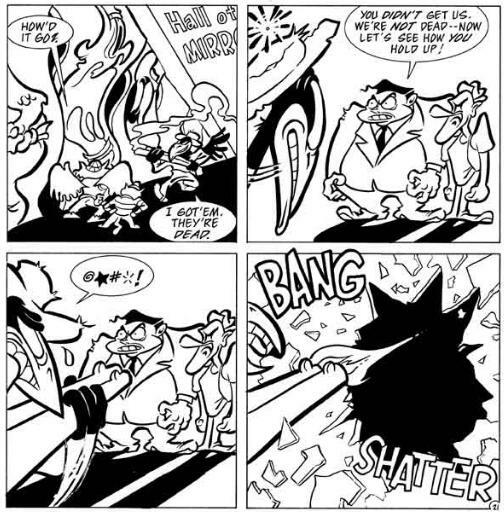 Knight’s work on TMNT Adventures is somewhat polarizing amongst fans, but I’ve always enjoyed his sense of humor. Admittedly, I’m a bit of a sucker for a “Honeymooners” parody (I’m probably the only person who likes the Fred Wolf episode “Muckman Messes Up”). The aforementioned parody sure seems pretty random, and the story is more about Horton and Malphie than it is the Turtles (who hardly do anything and don’t even get involved in the final action save one splash page). I can see how that might turn off some readers; audiences buy an issue of TMNT Adventures Special expecting to read about the Turtles, not a pair of dead comedians and their rascally get-rich-quick schemes. Not that anybody bought this, since it went unpublished, but you get the idea. On that note, I’m grateful to Knight for making the story available online. 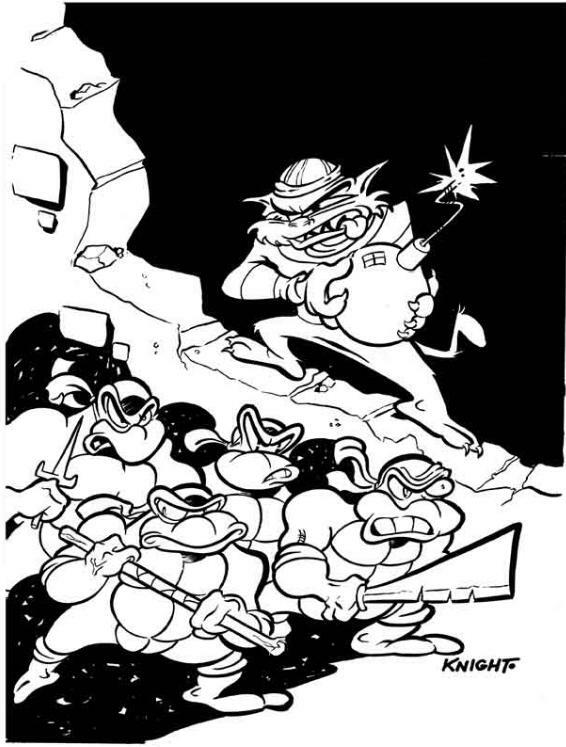 I wonder if any other artists out there have unpublished TMNT Adventures stories that went unseen due to the book’s cancellation? Back on the subject of the story, my major grievance is the ending not making much sense. Why are Horton and Malphie rich all of a sudden? The Turtles didn’t wrestle anybody, at least so far as we ever saw, so they didn’t make any earnings from that. Was there a reward for the capture of the Uncanny Trio by the police? Is that where they got the money? Because there’s no mention of such a thing in the story. As thrilled as I was to see a trio of one-shot villains make a comeback, ineffectual though it may have been, this wasn’t one of Knight’s stronger scripts. His art is still as crazy as ever, though I found it a bit hard to read in black and white; or maybe it was just the low resolution scans. While “Coney Island Days” isn’t my favorite of Knight’s contributions, again, I’m very thankful he was willing to share it with us. "I wonder if any other artists out there have unpublished TMNT Adventures stories that went unseen due to the book’s cancellation?" I echo the grateful sentiment toward Mr. Knight. The matter of other unpublished stories might be a good question for somebody to ask Steve Murphy. Say... that might make for a good interview/feature article for this blog once you finish up your Archie issues! i hope you will soon tackle mirage comics again. the achie stuff turns with every aging day of my life more and more looney. Before you go back to doing Mirage books I want to see your review on Adventures Special #11. I feel like you will have some great insights regarding April being mutated into a Turtle.